Hunters have been exposed to the truth of the World of Darkness that monsters exist, preying upon humanity and they lash out at or reconcile their oppressors. But how does the world and its monsters respond to these dangerous people? Does the supernatural even notice them? Is their crusade in vain? 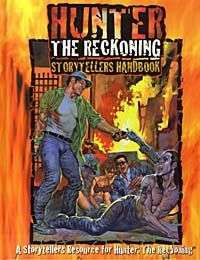 Hunter: The Reckoning is devoted to the stories of individual people who are chosen to witness monsters and come to grips with their existence. But what do monsters think of these upstart mortals? How do you as Storyteller keep hunters ignorant of the whole truth now that theyve had a glimmer of it? How do you scare your players as much as their characters? The Hunter Storytellers Handbook answers these questions and helps you get the most out of your Hunter chronicle.